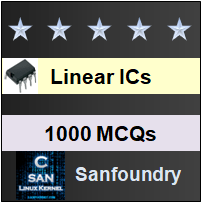 This set of Linear Integrated Circuit Multiple Choice Questions & Answers (MCQs) focuses on “Differentiator”. Explanation: Differentiation amplifier or differentiator is a circuit that performs mathematical operation of differentiation and produce output waveform as a derivative of input waveform. 2. 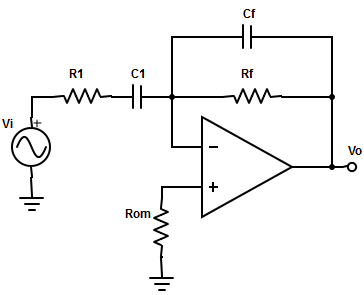 Find out the differentiator circuit from the given circuits? Explanation: The differentiator is constructed from basic inverting amplifier by replacing the input resistor R1 by replacing a capacitor C1. 3. 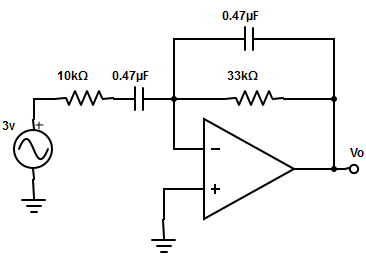 Determine the output voltage of the differentiator? Explanation: The output voltage is equal to the RF×C1 times the negative instantaneous rate of change of the input voltage Vin with time. 4. which factor makes the differentiator circuit unstable? Explanation: The gain of the differentiator circuit (RF / XC1) increases with increase in frequency at a rate of 20dB/decade. This makes the circuit unstable. Explanation: The input impedance of the amplifier decreases with increase in frequency and make the circuit susceptible to high frequency noise such that noise can completely over ride differential output. Explanation: The gain limiting frequency, fb= 1/(2π×R1×C1). fb= 1/(2π×10kΩ×0.47µF)= 1/(2.9516×10-2) = 33.89Hz. 2. Feedback capacitor shunts with feedback resistor. 8. Select the order in which the frequency should be maintained to enhance the stability of differentiator? Where fa -> Frequency at which gain =0 ; fb -> Gain limit frequency ; fc -> Unity gain bandwidth. Explanation: The value of internal resistor and capacitor and feedback resistor and capacitor of the differentiator values should be selected such that fa < fb < fc to make the circuit more stable. 9. Which application use differentiator circuit? Explanation: The differentiators are used in FM modulator as a rate of change detector. 10. A sine wave of 1vpeak at 1000Hz is applied to a differentiator with the following specification: RF =1kΩ and C1=0.33µF, find the output waveform? 11. Choose the value of RF and C for a 5kHz input signal to obtain good differentiation. => Vo(s) /V1(s) = -SRF×C1/(1+SRF×CF)2 or Vo(s) /V1’(s) = -S×RF×C1/(1+R1×C1)2.